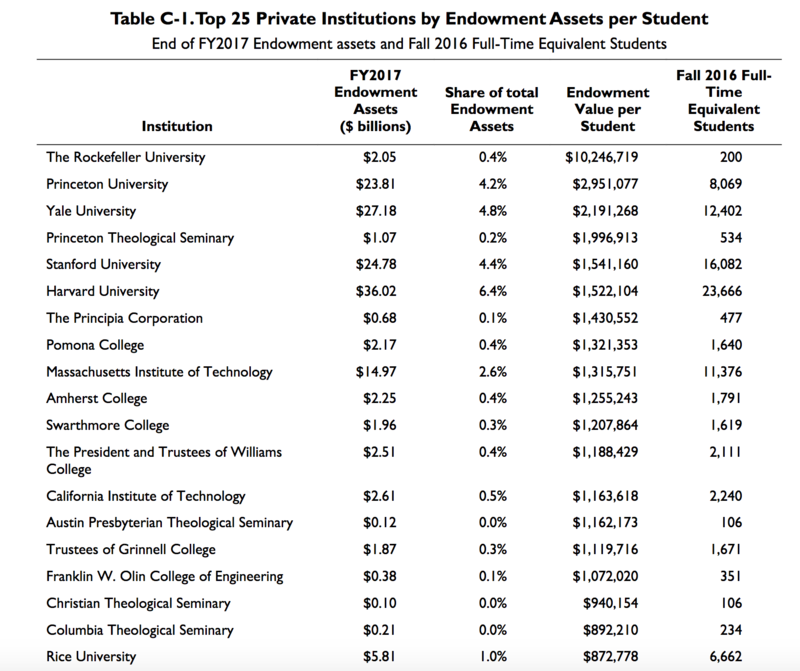 Currently browsing posts filed under "Endowment"
1) Pomona, Amherst and Swarthmore have the wealth to compete more effectively with us, mainly by hiring more faculty. Will they? 2) Does this data fully reflect the fact that Amherst has been increasing its student body? I don’t think so. Latest first year class at Amherst was 470, which which generates a four year student body of 1880. This number would bring down the endowment per student down a bit. 3) I seem to recall that we used to be further ahead of Amherst/Swarthmore. True? What happened? 4) The meaning of “student” — undergraduate, Ph.D., business, law, etc — varies significantly across institutions, so it is hard to compare liberal arts colleges with places like Princeton and Harvard. Should I spend a week on this topic? Two points about the ongoing debate over whether Williams should sell the oil and gas assets in its endowment. First, oil and gas assets do not necessarily help boost the performance of the Williams endowment. Williams endowment earned -1.5 percent for the year ended June 30, 2016, even though its managers held oil and gas assets. 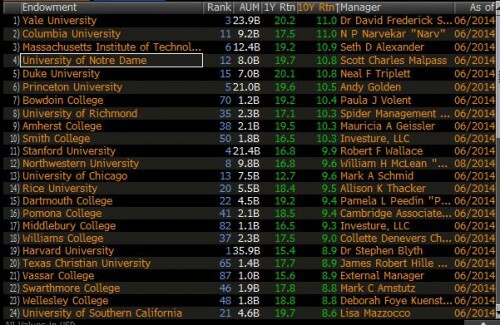 Yale’s endowment, by contrast, where managers are selling out of the oil and gas sector, earned +3.4 percent over the same period. Second, there seems to be some confusion what it means when critics say Williams’ trustees have financial interests in oil and gas assets. Critics pressing Williams to sell oil and gas assets do not make a priority of trustees holding oil and gas stocks through retirement or personal mutual funds. They are more concerned about trustees who, through their jobs, profit from dealing in oil and gas. A trustee who works in an academic institution whose retirement fund owns Exxon stock is one thing. A trustee who works for a private equity fund restructuring an oil and gas company to maximize the return upon its sale to a third party is another thing. A hedge fund trading in and out oil and gas assets to boost quarterly earnings is a third thing. A review of the current roster of 21 trustees suggests that, through their jobs, as many as 10 have active financial interests in the oil and gas sector. Thus, any vote by the trustees on whether or not the Williams endowment should sell out of the oil and gas sector begins with a financially interested bias on the part of up to half of them. 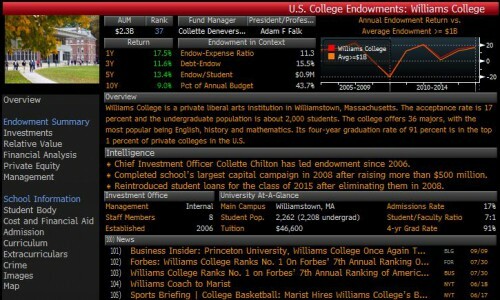 Here is some one-year-old information about the Williams endowment, courtesy of Bloomberg. Remind me again why we have to pay Collette Chilton more than $1.2 million dollars a year? There is a great, juicy story here. Why won’t someone at the Record write it? 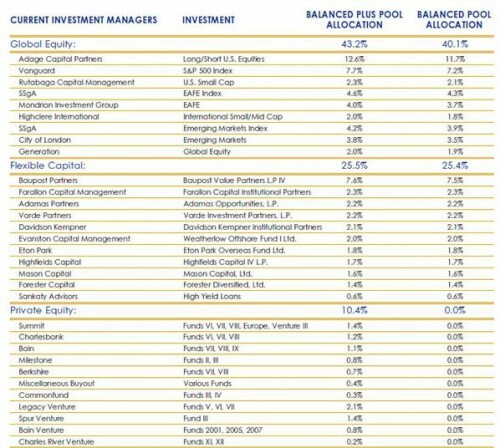 Which Managers Does Williams Invest With? One sentence in Abigail Wattley’s ’05 op-ed in the Record has generated some confusion. We don’t disclose the list of our fund managers because of agreements we have entered that relate to confidentiality. Unsophisticated readers might assume that Wattley meant, “Our managers require us to not reveal that we have invested in them, otherwise they would not want to do business with us.” That is, the managers insist on confidentiality and there is nothing the College can do. Indeed, many (most?) of Williams managers are publicly identified by at least some of their clients. If The Boston Foundation can provide a listing of its managers, then why can’t Williams? Note, also, that these managers are some of the most elite and sought after in the business. Some (Baupost?) are probably even closed to new investors. And yet they have no problem with tBf making their status public. Should we expect members of the Williams Investment Office (like Wattley) and the Williams trustees to know about the practices of places like The Boston Foundation? Well, in addition to being a similar sized endowment in the same city, The Boston Foundation has a CEO (Paul Grogan ’72) and a board chair (Michael Keating ’62) who are both former trustees at Williams! Not enough evidence? Consider the comments of Churchill Franklin, CEO of Acadian Asset Management and former chair of the board of trustees at Middlebury. You are right (as usual) the answer is no we [Acadian] don’t care and are happy to have the advertising. Some fund of funds and outsourced CIOs are reluctant to share the names of the managers they select, because that is their “edge” and their value-add. Huge funds are sometimes reluctant to share the names of their managers if they are trying to protect limited capacity, but the managers are almost always happy to have their names shared. I could produce similar quotes from Ephs in money management if I thought doing so wasn’t a huge waste of their time. But, if that were so, then how could I possibly know that all of these firms (pdf and pdf) have managed money for Williams in the last few years? If the College really had “agreements … that relate to confidentiality” and which prevented the College from reporting that its managers included SPO, Summit, William Blair, Charlesbank and so on, then how do I know about these managers? The cynic in me is afraid that Wattley is purposely trying to mislead the Williams community. She (or her boss Collete Chilton . . . or her boss’s boss) don’t want other Ephs to know who we invest in. Of course, they don’t want to lie too obviously. They just want to string together a bunch of mostly-true-individually but misleading-in-the-aggregate sentences that give everyone the impression that the College’s hands are tied. If the Record were a better paper, it would find out the truth. Start by asking for some example language from one of these “agreements” about the required “confidentiality,” perhaps from one of the firms that are already public. In fact, why not start with Charlesbank! It is perfect. First, it happily allows some of its clients, like The Boston Foundation, to report its involvement. Second, Williams already reports an investment. Third, a (the?) senior member of Charlesbank is Michael Eisenson, chair of the Williams Trustees, and Abigail Wattley’s boss’s boss. “Secrets of the Academy: The Drivers of University Endowment Success” (pdf) provides a useful overview of academic research on endowment performance. When we considered the top-performing university endowments and contrasted them with other institutional investors, several organizational features of the endowments stand out. First, the top-performing endowments have active investment committees, typically drawn from the ranks of alumni. These bodies typically see their role not as micro-managing the decisions of the investment staff, but rather in setting broad policy and serving as an informed sounding board. The contrast with public pension funds, where the bulk of the staff is drawn from rank-and-file employees, is particularly stark. Second, the staff of successful academic endowments typically has considerable experience and has often worked together for many years. Finally, the staff of successful university and college endowments has an academic orientation, which leads to a process of periodic self-evaluation. Many of these funds occasionally stop to consider the processes that led them to make investments that proved particularly successful or problematic. They often engage in an active dialog with their peers. Highly recommended. Want to write a great senior thesis in economics? Study the history and performance of the Williams endowment. The Williams College Investment Report 2009 came out in October last year. (New readers may want to review my three part series.) Where is this year’s version? If I could make only one request of this year’s report, it would be to show benchmark information, both for the endowment as a whole and for each major category. The endowment portfolio earned an investment return of 11.0% for the year and was valued at $27.4 billion as of June 30, 2010. The return for the year was 160 bps above the return that would have been earned by our Policy Portfolio benchmark. If Harvard can report a return for its benchmark, then so can Williams. 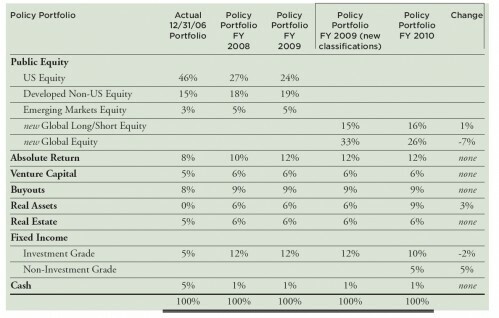 If Harvard can report the returns of the major components of the endowment relative to their benchmarks, both over this year and the last 10 years, then so can Williams. There is no excuse for Williams to be less transparent than our peer institutions. What do we have to hide? With the 2010 financial statements just off the presses I thought it might be interesting to try to construct a side-by-side comparison of the Williams and Amherst endowments. I’ve tried to group the various assets in each endowment to allow for some rough comparisons. At the bottom of the page I’ve computed some ratios that I find interesting. 1) Amherst is more aggressively invested and has less flexibility over its aset allocation. The key thing here is how much each school has in “Level III” assets, and how much additional cash each can be required to invest in these assets. The values that colleges report for their Level III assets, literally, are educated guesses, and nothing more, and the state of financial reporting on them, while improving, is still poor. 2) Despite its heavier investment in illiquid, Level III assets, Amherst says it expects a long-term return of about 6.8%. Williams puts its expected long-term return at 8%. 3) Last year in the management discussion, Amherst showed that its target and actual asset allocations were kind of far apart. This year there is no discussion of its target and actual asset allocations. Williams did disclose its target allocations in the notes to its financial statements, and its actual allocation seems to be reasonably in line with the target. 4) Amherst’s unfunded cash calls are 53% of its combined Level I & II assets, compared to 30% for Williams. This would only be a concern when cash calls exceed distributions from Level III assets. When that happens (as it did last year for Amherst) one has to go to the Level I & II assets. I don’t consider myself an expert at analyzing a college’s financial performance. This is simply a lay person’s attempt to read and understand via a seat-of-the-pants camparative method. I believe that the important decisions, regarding things like admissions & financial aid policy, staffing levels, salary freezes, construction plans, etc., are influenced more by the trustees’ expectations about the near-term prospects for the endowment than by any other single factor. It seems at this point that Williams Trustees seem to feel that the worst is behind us endowment-wise, and that Amherst feels that it has a lot of heavy lifting to do. I’m very interested to know whether other Ephs and Jeffs have a different take. The return on our endowment investments for the fiscal year was 11.9%. Factoring in gifts to the endowment and spending from it, this put our total funds on July 1 at around $1.52 billion, a welcome increase over its value last year, but still more than 20% lower than this time three years ago. We project spending some 5.1% of that in the current year. Although that rate is widely considered to be unsustainable over the long run, it is part of a Board-approved plan to soften, over last year and this one, the impact on Williams of the world financial crisis. 1) This is not inconsistent with the $1.6 billion number that was mentioned in June but it is less than I expected. Did various illiquid investments come in lower than Chilton expected three months ago? 2) 5.1% of $1.52 billion is $77.5 million. That is too much spending! The College continues to not take the financial crisis seriously enough. Note that Morty claimed two years ago that the plan was to spend $70 million from the endowment in fiscal year 2011. Why isn’t Williams sticking with that plan? Because the people who run Williams don’t want to cut the budget enough. Future Williams administrators will curse their profligacy. 4) As usual, the College ignores its debt when discussing spending rates. Williams has a $1.5 billion endowment, but we also have around $250 million in debt. So our net financial wealth is $1.25 billion. Assuming a 3% real rate of return on that would allow for $45 million in annual spending from the endowment. Williams is spending approximately $25 million more per year than it should. As many of you know, when the financial crisis hit, the College put two building projects on hold. I remain optimistic that we’ll be able to begin work this spring on the new Sawyer Library, which we continue to seek funds for. Meanwhile, the Weston Field project is undergoing a review to make sure it’ll provide what we need at the right price. I’m optimistic about this project, too, though on a somewhat longer timeframe. Williams is not rich enough to be able to afford major changes at Weston for years to come. I hope that Falk and the trustees adjust to this reality. Stetson/Sawyer is a tougher case. Full letter below the break. A rule that limited annual endowment-spending growth to historically plausible levels would have generated more savings and a bigger endowment to draw on when the collapse came. As it always does. One way of formulating such a rule is just to say that no matter what is happening with the endowment, inflation-adjusted spending from the endowment will never be allowed to go up or down by more than a certain stated percentage from one year to the next. Institutions did not plan for the volatility they have experienced, and they, their students, and their employees are now paying the price—and not merely in cold breakfasts, but in hiring freezes, construction plans disrupted in midstream, and confusing changes in student aid. With more forethought they can do better next time. In other words, instead of aiming to spend around 5% of the endowment value each year, Williams should (and, I think, now does) aim to spend X dollars, where X is about $75 million. This amount should grow steadily with inflation, therefore allowing the College to plan its spending for a stable environment. If the endowment is up a great deal in the next few years then, obviously, the dollar spending could be raised. But the safest course is not to raise that spending until you are sure that you can afford to keep it there, even if endowment returns are poor for a decade or more. I agree completely with this analysis. Targeting a dollar amount to spend each year is clearly better. Being very conservative with that amount, relative to the total endowment value, is important. My main (continued) complaint is that the College is still spending too much. But, if we just keep that dollar spending at $75 million for 5 or 10 years, then the natural growth of the endowment will get the endowment percentage spending rate down something more like 3%, which is a sustainable rate over the longterm. Is this a typo or some inside scoop? Investors in private equity funds are still searching for the ‘holy grail’ where their interests are perfectly aligned with the funds investing their capital, an investor said on Thursday. Investors are seeing some better terms in their fund agreements since the financial crisis hurt funds’ returns and gave them more clout to negotiate terms. Still, some question whether their interests are really aligned with the firms which invest their capital, and whether any gains made on terms will just be lost when the economy and markets improve. Investors, known as “limited partners” (LPs) and private equity executives, known as “general partners” (GPs), have acknowledged for some time a shift since the boom years when GPs had more leverage to dictate terms as investors scrambled to get into their funds. “I think GP-LP alignment is the holy grail that we all talk about but may never see,” said Collette Chilton, chief investment officer at Williams College speaking at private equity conference Super Return U.S. on Thursday. Chilton oversees the Massachusetts-based college’s $1.6 billion endowment. 2) Chilton’s comments on LP/GP conflicts are perfectly sensible. Perhaps some readers could provide more background. Comments Off on Endowment Worth $1.6 Billion? “Harvard highlights how terribly wrong the endowment model can go when pushed to certain extremes in a climate of leadership crisis,” said the 81-page report, which was released today. The endowment model, pioneered by Yale University’s investment chief, David Swensen, relies on alternative assets including commodities, real estate and private-equity holdings to boost returns. Jane Mendillo, Harvard Management’s chief executive officer, said in a letter this week that starting July 1 compensation of her senior managers will for the first time be linked to the fund’s performance. The university plans to reduce senior manager pay in any year the endowment loses money and will review compensation annually, she said in the letter. and “wonder[s] how the Williams Investment Office salaries are paid …” As do we all! Here is my latest rant on that topic. The College refuses to report both how many Investment Office folk receive such bonuses and how much total money, if any, has been paid out. 2) The report harps on the conflicts inherent in having members of the Investment Committee (main example is Dartmouth) who serve two roles: First, they decide where the college should invest its money. Second, they manage that money themselves. As long as there is full transparency, I don’t worry about this. Greg Avis ’80 and Michael Eisenson ’77 are really smart! I trust Ephs like them to make good decisions. We just need enough information to keep an eye on them. See my three part series on the College’s Investment Report for complete coverage. 3) Exercise for the reader: Explain why SIEU paid for the report. As you may know, the College has been exploring ways to build a budget for the coming year that would both meet the target for spending from endowment and provide for some level of raises. In a bit of doubly good news, the College managed, through the efforts of many across campus, to construct a budget that met the target while providing for a raise for all continuing faculty and staff of one percent, and the Board of Trustees chose to increase the endowment spending limit in order to extend an across-the-board raise in 2010-11 to two percent. In doing so, Trustees expressed their appreciation for the thoughtful, principled, and effective process of reorganization that the campus is engaged in, which is positioning Williams for its strongest possible future. I couldn’t agree more. While work remains to align completely our operations with the new fiscal realities, a great deal of progress toward that goal has already been made. The Board thanks you for that as do I. We will increase spending from endowment even further in 2010-11 to take advantage of the Early Retirement Program, which in time will save money. Some 72 percent of eligible staff and 21 percent of eligible faculty have formally expressed interest in the program. We won’t, however, know for more than a month how many will ultimately take part. Thank you again for the impressive, collaborative way that you all are pitching in to help the College face these challenges. Roughly how much has Williams spent on major construction projects replacing or massively renovating existing buildings in the last decade? Since we’re now at a point where the cuts are starting to hurt, with raises on hold for faculty, a hiring freeze on staff (along with headcount-reduction-by-attrition? ), a couple million saved by going back to loans, another million by getting rid of need blind admissions, etc., I would like to get a sense of how much cash Williams sank into replacing Baxter, replacing the Adams Memorial Theater, semi-replacing Stetson-Sawyer, and major renovations to buildings like Mission and Morgan. What, at the end of the day, was the cost of all that construction during the bubble years? Any ballpark estimates or educated guesses would be much appreciated. If, for any reason, you don’t feel comfortable commenting in the thread below, please email me at ronitb at gmail dot com. Your anonymity will be protected. Williams College, a liberal arts school located in Western Massachusetts, saw is balance sheet shrink by 20 percent in the most recent fiscal year on some $427 million in nonoperating losses. Most of those losses stemmed from a $346.9 million hit to the college’s investment portfolio, according to financial filings. As of June 30, roughly a quarter of those holdings were in U.S. equities. Another 19 percent were in international equities; 12 percent were in fixed income securities; and 15 percent were in buyout and venture capital investments. Williams’ poor returns also weighed heavily on its endowment, which fell 22 percent to $1.36 billion in the fiscal year ended June 30. The college’s total assets were valued at $1.64 billion, down 20 percent from the $2.06 billion on its books a year earlier. The college said 2009 student-related revenue slipped 3 percent to $58.7 million, versus $60.5 million booked a year earlier. Williams said gifts and grants in fiscal 2009 totaled $41.3 million, more than double the $19.6 million collected in the prior year. Most of this we already knew, but I don’t recall discussing the drop in gifts. Meaningful? Are the changes in this number often lumpy? Is the drop just a function of the end of the capital campaign? Commentary welcome! The College is making some fairly radical changes. Is anyone on the faculty paying attention? Or do they just assume that financial industry hot-shots always know what is best? Just asking! The less important change here is the move from looking at equities on a domestic-versus-international basis to grouping all public equities into a single Global Equity class. See this report from MSCI/Barra (pdf) for an overview of the issues involved. I agree with this switch. Click on the images for better views. Can you spot the inconsistency? Details and discussion below. Q: The Boston Foundation, run by former Williams trustee Paul Grogan ’72, and Grinnell College provide information on the outside managers they employ. Why doesn’t Williams? A recurrent theme is that the Report is completely correct when it emphasizes the importance of, among other things, transparency and fees in its dealings with outside managers. By continually monitoring outside managers, the Investment Office extends its initial due diligence into a formal regime designed to verify that each investment management firm is meeting its investment objectives, the overall objectives of the portfolio with respect to transparency, liquidity and concentration, and other requirements. Just so. But then the we should hold Williams to the same standards. If the College is going to demand transparency from outside managers than we — alumni, students, and faculty — should demand a similar amount of transparency from Williams. In particular, Williams should meet the highest standards of endowment transparency. 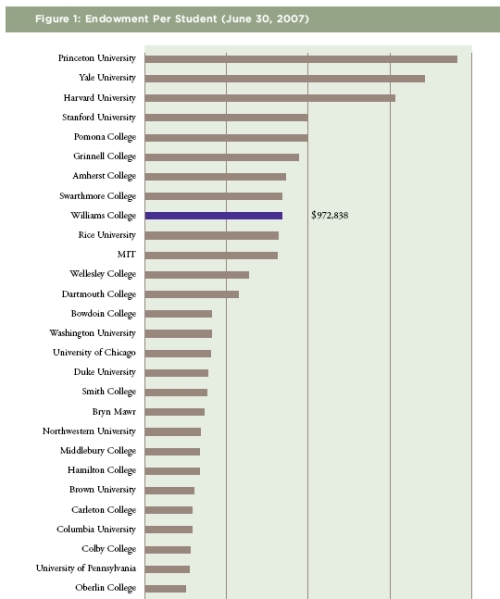 The Williams College Investment Report 2009 is available. I believe that this is the first year that the College has issued a separate report. Normally, the only investment related information that is made public comes in the annual A Report From Williams. This version is much more detailed. Kudos to Williams for preparing this report and for making it public. I will put the proposed questions in bold and then associated background/commentary in [italics]. Some members of the Investment Office are eligible for bonuses based on the return on our investments, though the office is so new that we have not completed the first year of returns on which bonuses would be computed. So, in the past ten years no such bonuses have been paid. See below for more questions. The first of many interesting June 30th, 2009 annual reports just popped up and – wow! – is it ugly. 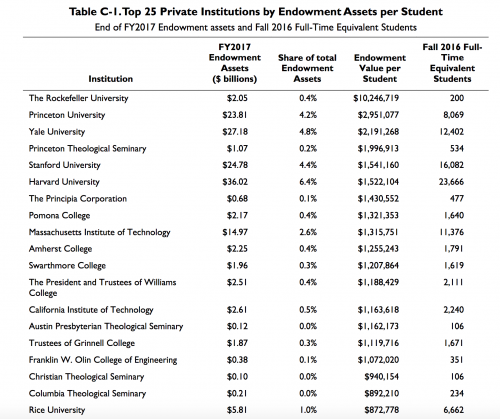 Haverford posted a staggering 35.6% drop in endowment value from one year earlier. No wonder there hadn’t been any “updates on the economy” from the President. With a total endowment of $336 million. $140 million is in Level 3 assets — the new accounting lingo for assets such as private equity partnerships for which there is no established market price. With a total endowment of $336 million, they have about $192 million that is liquid within 12 months. They have $104 million of debt. And they have $140 million of outstanding cash calls that they expect to be called within the next four years. I don’t know what their budget calls for, but last year’s endowment spending would be 7.3% of the new endowment number. Essentially, they are going to have to cash out the entire liquid portion of their endowment to cover operating expenses and private equity cash calls over the next four years. Breathtaking. I think there are going to be many more of these reports to come. It’s a 36% year to year decline. The actual investment loss was 32.8%, then you have subtractions for operating draw and additions for gifts. BTW, Bowdoin and Middlebury have posted their year end reports, too. Nothing stood out about Bowdoin except high cash call commitments (relative to their endowment size) and they borrowed $20 million in taxable bond debt in May 2009. I haven’t looked at Middlebury. Whatever happened to tradition? To honor?! To liberty?!?!?! 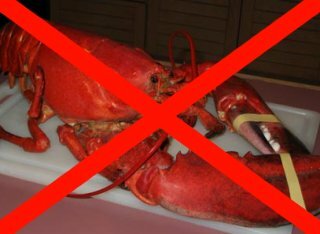 Now, I have never really cared for lobster, considering it an icky bottom dwelling sea bug. But non-lobster eaters such as myself always had the option of a strip steak instead, which left more lobster for our lobster eating brethren. However, the steak has also disappeared from the menu. The only proteins on there seem to be chicken and baked haddock. Baked haddock?! You might as well cancel Harvest Dinner altogether at this point. This is the most serious casualty of the cost-cutting, by far. 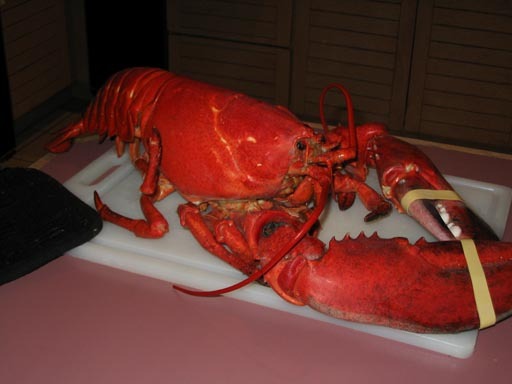 UPDATE: Hey Dining Services – lobster’s a bargain right now. Prices are down by almost 50% from two years ago. From David: Useful article on private equity. No specific mention of Williams, but lots of good background for those interested in how the endowment does/should invest. From hwc: Year end endowment numbers are starting to roll in. Here’s a Bloomberg article today with year end estimates from the finance people at Swarthmore, Pomona, Davidson, and Smith. From David: Useful overview article on the venture capital industry. Williams has appoximately 10% of its endowment in venture capital. It is a very hard question as to whether or not a better number would be 2% (closer to the average of large institutions) or 20%. Vicarious’83 asks: As a practical matter, I wonder how much flexibility the college even has to adjust its allocation to these types of investments in the short run? Comments have been moved over from Speak Up! 1) The Record should do an article about Chilton’s compensation. Don’t the editors believe in muckraking anymore? I bet that some of the more left-wing Williams professors would provide good quotes, either on or off the record. Don’t think that there is anything suspect going on here? Perhaps you failed to read the College’s letter to the Senate Finance Committee. In other words, the College worries that Chilton and other (how many?) investment professionals won’t work hard enough even though Williams is paying them hundreds of thousands of dollars per year. So, in addition to all that guaranteed money, we need to pay them extra bonuses or else they’ll —- what exactly? Spend all day at the movies? I think that this is the sleaziest arrangement at Williams today. a) Both Morty and key trustees were in favor of starting an Investment Office and other steps for turning Williams into Yale. b) No one worried too much about Chilton’s compensation. The Trustees, of course, see their role as more supervisory. They don’t set salaries. There may have been a head-hunter or compensation consultant involved. Morty, while in theory worried about the College’s overall budget, had no real incentive to pay Chilton less. Never forget that Morty, for all his many wonderful qualities, is not — How to put this politely? — immune to the siren song of worldly wealth. It is not out of the goodness of his heart that he serves on the board of MMC. It was not an accident that he failed to take a pay-cut, unlike presidents at some other schools, during the budget crisis. It is not irrelevant to him that the Northwestern job pays around twice as much. It was not via random motion that his annual salary increased by hundreds of thousands of dollars during his time at Williams. So, subconsciously or not, Morty would realize that a proposal to pay the new Chief Investment Officer substantially more money than he was then making would only provide a (dramatic?) upward push to his own compensation. c) This deal was made in the bubble years. There is no way that Chilton could find a comparable job paying this much money today. Even for 2006, the compensation is excessive. Professionals I quizzed felt that someone with Chilton’s resume — modest compared to others in the field — would be somewhere in the $300,000 to $500,000 range when her contract was signed three years ago. 3) What should be done? The College ought to close the Boston Investment Office. (Read the whole comment thread for details and background.) Most/all of the senior investment professionals (like Chilton) would decline to move to Williamstown. Problem solved, without any nasty firings or salary cuts. In a financial crisis in which Williams can’t afford to spend a few thousand on the Williamstown Jazz Festival, we can’t afford a Boston Investment Office. Williams’s endowment was valued at $1.81 billion on June 30, 2008, 4.4 percent less than a year earlier, according to the National Association of College and University Business Officers. The school in Williamstown, Massachusetts, planned for a 35 percent loss for the fiscal year. Williams, tied with Amherst College, in Amherst, Massachusetts, for the top liberal-arts institution in U.S. News & World Report rankings, plans to continue cutting costs, Wagner said. 1) Morty told us at reunion that the endowment was worth $1.4 billion. Given that the S&P 500 was at 946 at that point and then fell 2.4% to finish the (fiscal year) at 923, we might adjust Morty’s estimate of a down 17%-18% result for the year to around 20%. So, if the endowment started the year at $1.8 billion and we lost 20%, then we should now be at $1.44 billion. But the College also spent $90 million from the endowment. (Most current gifts would have gone directly into spending as well.) It matters a bit whether or not you subtract that $90 million from the start of the year or the end of the year value, but, round numbers, the value of the endowment for Jun 30, 2009, when the final report reaches us next fall, will be somewhere around $1.35 billion. You read it here first. 2) At some point, I hope to do a much more formal analysis, like last year’s. Perhaps someone will save me the trouble and do it now. 3) The big unknown is the valuation of the hundreds of millions that the College has invested in private equity and venture capital. If the College had invested $50 million in a private equity fund in June, 2008, what is that money worth now? Hint: It is much less than $50 million? But, in some respects, the “true” valuation is beside the point. What valuation with the managers of the fund report to the College? I don’t know but I am highly suspicious. And the fact that these amounts are “audited” by auditors paid for by the private equity manager gives me about as much comfort as a AAA rating from Moody’s. 4) But, I suspect that Morty might have already have had some early information about these valuations, so I suspect that his $1.4 billion number is “accurate,” or at least consistent with what the College will report in the fall. A smart Record reporter, however, would check to see if this claim is consistent with Morty’s talk in October 2008 and the market movements since then. Another item on the to-do list. UPDATE: Thanks to eyetoldyouso for noting this July 1 letter from President Bill Wagner. As you know, the June 30 endowment figure plays an important role in the College’s financial planning. While it will be months before we have a final audited figure, it is likely that our investment return will be better than the -35% that we conservatively used in our planning model. If that proves to be true and if our return for the next two years comes close to the zero that we have been modeling, that would reduce to some degree the extreme pressure that we had projected the College facing a couple of years from now. We still, however, continue to face significant challenges and will need to follow through on the cost-saving measures we have put in place. 1) Perhaps Wagner is just low-balling the numbers — like any good corporate CEO — so that the the College can provide an upside surprise in the fall. 2) Perhaps I misunderstood Morty and the -18% number was just for the College’s liquid securities (those that Chilton would have good estimates for), without factoring in the performance of things like private equity and venture capital. I really don’t think that this is what Morty meant. 3) Perhaps further news as come out in between Morty’s talk at reunion and this letter. It could be that Chilton thought on June 1 — either guessed for herself or was told by her managers — that the losses on illiquid securities were X. Then, around June 30, she figured out that the losses were Y, with Y being much greater than X. So, the College might actually report a loss between 25% and 30% in the fall. This seems unlikely but not impossible. For my sins, I will try to explain the right way to think about the Williams endowment to Jeff and others. More below for those interested. 3) The key numbers to watch are the College’s spending from the endowment, which was $91 million this past year and has been budgeted for $78.5 million this coming year (fiscal 2010) and $70 million the following year. Morty promised the trustees that he was going to put those budgets “to bed” so that either his successor or interim president Bill Wagner would be able to use those budgets going forward. Morty insisted that “Williams would still be Williams” even with this necessary belt-tightening caused by these decreases. He promised no change in financial aid, no lay-offs, no team cuts (from 32 varsity teams) and no dining hall closures (from the 5 currently). 4) Morty has spent more time on budget issues over the last year then he did in the previous 8 years put together. The Ad Hoc Committee on Budget Priorities (CBP) has met for hours and hours. Morty has been impressed with the process and pleased with how the community has come together. Although Williams never truly “wasted” money before, there was a lot of spending that could be cut without fundamentally changing the character of the college. 5) The CBP even specked out a budget for fiscal year 2012 that used only $62-$63 million of endowment spending. Basic idea was to plan for a very bad but not totally disastrous scenario. [Although Morty did not go into details, this is a world in which the value of the endowment is around $1.25 billion on June 30, 2011, both because the College has spent over $140 million in avail over the next two years and because investment returns plus gifts have lagged. In that world, the Trustees would expect the College to have, after three years of adjustment, gotten to a sustainable avail percentage of 5%, which would generate $62.5 million of spending a year. Morty feels that the CBP has created a budget for that scenario, one which maintains the key aspects of Williams (aid, no lay-offs, no team cuts or dining hall closing). He is quite pleased to have completed this planning. 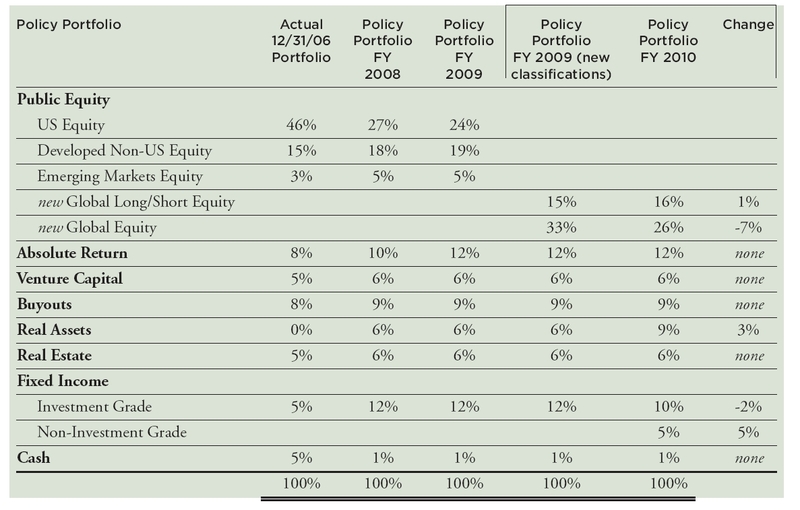 6) If the endowment is much below $1.25 billion on June 30, 2011, then all bets are off. [Morty did not cite that date/amount specifically, but just talked about situations in which the endowment was much lower than it is today.] Morty mentioned sacred cows like aid for international students, dining halls and sports teams. He didn’t want to cut any of those things, nor would his successor. But, if the money isn’t there, the money isn’t there. 1) Perhaps the only jarring note was Morty making a big distinction between aid for US students and aid for internationals. Is Williams really so parochial as that? There may come a time when we need to cut aid, but we should do so without regard to citizenship. Discriminating against internationals in aid awards makes no more sense today than discriminating against Jews in admissions did 75 years ago. 2) All of the above is perfectly sensible. Morty and the trustees and the folks on CBP are smart and caring Ephs. They are acting in the best interests of the College and making sensible trade-offs. 3) However, they are all wrong about two key assumptions. First, instead of looking at the value of the endowment, they should look at the net financial wealth of the College, which we can safely approximate as endowment minus debt. With a debt of around $260 million, the difference matters. Second, a long term real growth rate assumption of 5% is highly implausible. (If Williams could grow its investments at 5% and world GDP growth is 3%, then eventually Williams would own the world. Unlikely!). So, the worst case assumption of spending $62.5 million out of a $1.25 billion endowment in fiscal 2012 is profligate. Net financial wealth (in that scenario) would only be around $1 billion and a reasonable real return assumption is closer to 3%. So, in that world, the College ought to be planning to spend much closer to $30 million than $62.5 million. More money to Williams? No thanks. I’ve taken myself off most Williams mailing because the College financial situation and its causes are too discouraging. The Achilles Heel of 501 (c)3 nonprofit corporations is the lack of public accountability. A fundraising e-mail from Williams slipped through my defenses the other day. No mention of any lessons learned. I stipulate here that I have no reason to believe other than that those governing Williams are honest people committed to good work for the right reasons. Something is missing, though, in the discussions. 1.) Over the past decade and more, Williams has built and built and built. allocation was as high as 80%. and bonds. Precisely to avoid what’s happening at Williams. board stepped down over this fiscal fiasco? The topic of the endowment has come up several times in recent threads. Below are my thoughts. Summary: Williams is in much better shape than many other schools. But, still, its lack of transparency is troubling. The Trustees are meeting this weekend and will, presumably, get a briefing about recent performance. They should ask some hard questions, especially about the value of the College’s investments in private equity and real estate. Given the (probable) state of the College’s finances, they should reject the proposed avail spending of $79 million for 2009-2010 and force the Administration to produce a more responsible budget. A useful graphic in the annual update on the endowment tells us how Williams compares to its peers in terms of endowment dollars per student. This is a standard measure of relative institutional wealth. 1) What “students” are counted in this calculation, just undergraduates? Surely not all of Harvard’s endowment is dedicated to the education of undergraduates but, at the same time, undergraduates are not as expensive as business/law students because the latter come close to paying their own way. 2) Keep in mind that this graphic is misleading since it does not take account of debt. To do this calculation properly, you need to subtract each college’s debt from its endowment before dividing by the number of students. Williams has $260 million of debt. There was no reason to take out this debt except to lever up the endowment. That idea (which may or may not have been stupid a priori) cost Williams around $50 million. Thanks Morty! 3) For months, I have claimed that the situation at Williams is much more serious than most people realize and that any attempt to keep the two promises that Morty has made (no lay-offs or changes in financial aid) will require cuts that most readers find unacceptable. Others disagree. Fine! In a year or two, we will know for sure who is right. If I am right, more and more schools on this list, even schools as wealthy as Williams, will have to make sorts of cuts that Williams has (so far) avoided. If my critics are right, that won’t happen, Morty will keep his promises while Williams maintains its long-term financial health. Wellesley College, three spots below Williams on the list, just fired 44 employees. Anyone who thinks that we are immune from the forces buffeting Wellesley is ill-informed. 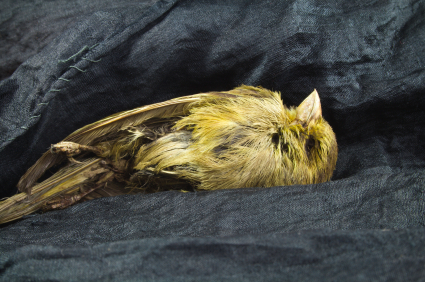 They are the canary. We are the miner. And shiver from the cold. UPDATE: From a poem by Nevin Steinberg. Title and rest of poem now lost. EphBlog is powered by WordPress and delivered to you in 1.776 seconds using 56 queries..